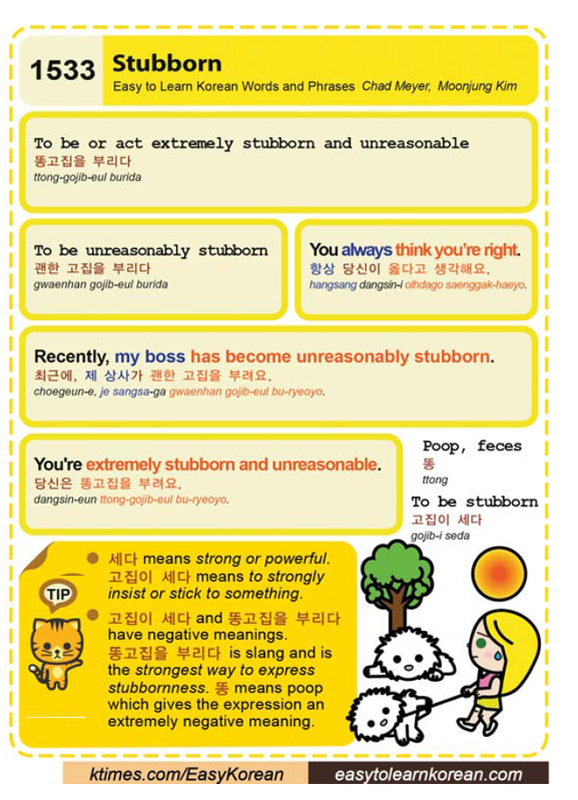 Easy to Learn Korean 1533 – Stubborn. Posted in Series	| Tagged feces, my boss has become unreasonably stubborn., poo, poop, powerful, recently, slang, strong, strongest way to express stubbornness, strongly insist or stick to something, stubborn, To be or act extremely stubborn and unreasonable, to be stubborn, To be unreasonably stubborn, ttong, You always think you’re right., You're extremely stubborn and unreasonable., 고집이 세다, 괜한 고집을 부리다, 당신은 똥고집을 부려요., 똥, 똥고집을 부리다, 세다, 제 상사가 괜한 고집을 부려요., 최근에, 항상 당신이 옳다고 생각해요. 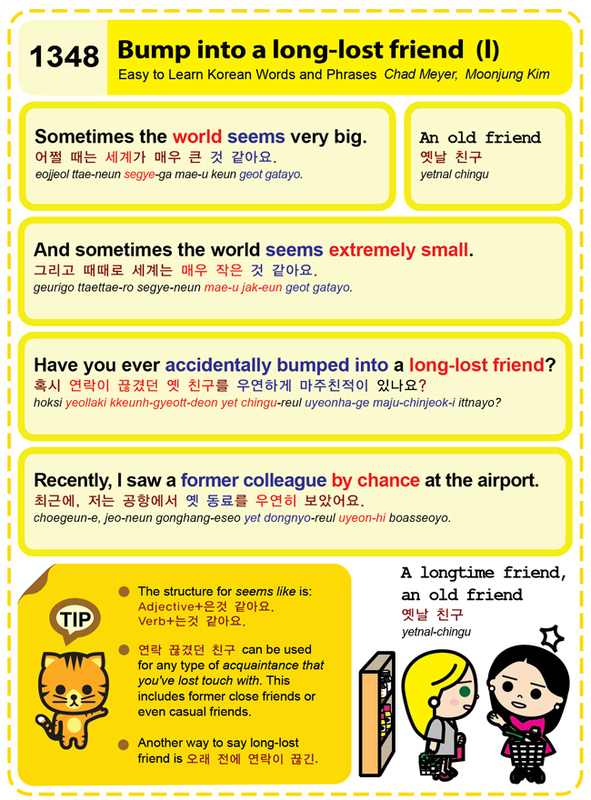 Easy to Learn Korean 1348 – Bump into a long lost friend (part one). Posted in Series	| Tagged A longtime friend, acquaintance that you've lost touch with, Adjective+은것 같아요, an old friend, And sometimes the world seems extremely small., bump into a long lost friend, Have you ever accidentally bumped into a long-lost friend?, I saw a former colleague by chance at the airport., recently, Sometimes the world seems very big., Verb+는것 같아요, 그리고 때때로 세계는 매우 작은 것 같아요., 어쩔 때는 세계가 매우 큰 것 같아요., 연락 끊겼던 친구, 옛날 친구, 오래 전에 연락이 끊긴, 저는 공항에서 옛 동료를 우연히 보았어요., 최근에, 혹시 연락이 끊겼던 옛 친구를 우연하게 마주친적이 있나요?